Most users all need a video editor with simple operation steps and powerful functions. So, what are the features of good video editing software? Firstly, it’s supposed to be small in size. Secondly, it can cut, merge, clip, segment, render and so on. Then, it is powerful in format conversion. Finally, it can edit video accurately, even better to millisecond. idoo Video Editor can help you finish your video editing perfectly. It’s a good video editing software for Windows 7/8/10. It’s small in size. For new users, it’s very easy to learn how to use it. It supports lossless video editing. Besides, it excels in video format conversion for almost all the formats. It can even convert format for video depending on the special kind of mobile device. It’s also a good video editing software for YouTube. After conversion, idoo Video Editor can output the video with great speed. In a word, it can help you to complete your video editing in a super-quick and precise way. This software possesses functions as follows: Join video clips together or split the video into segments; Cut videos and audios individually or in batches; Trim video to get the exact frame of images; Watermark or subtitle your videos; Rotate the videos by different angles; Edit and convert your 4K videos; Etc. Cropper: Get rid of unwanted areas of video images; Remove the black bars to adapt to the media players; Define the crop area sizes or keeps the aspect ratio, etc. Effect: Adjust the brightness, contrast and saturation to beautify your video imagery; Multiple special effects can be applied to the video simultaneously; Cut, crop, watermark and subtitle the video at the same time, etc. Subtitle: Adjust the vertical position of the subtitle; Define your own font style easily; Cut, crop, watermark and add effects to the video at the same time, etc. Watermark: Add both text and image watermarks to the video; Transparency and font style can be adjusted; Define the duration of the watermark display, etc. Joiner: Join videos and audios of various formats into one file; Optional transition effects to make your video more fluent; Easily set the order of files and the output formats, etc. 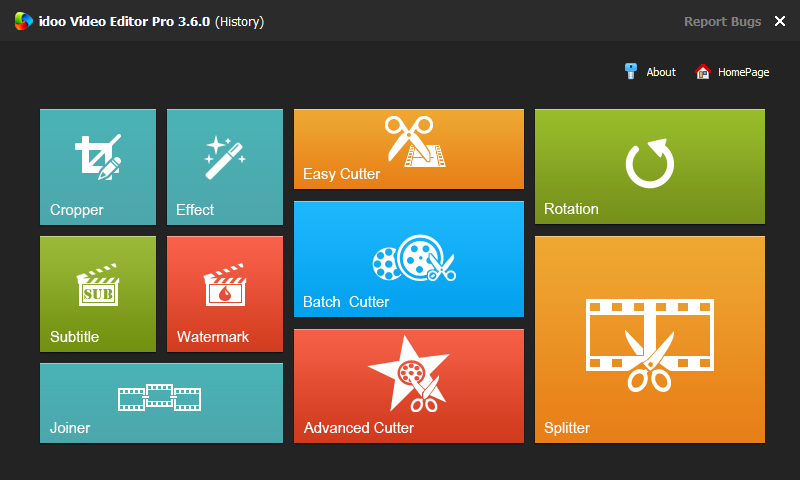 Cutter: Three types of cutting available to choose from: Easy, Batch and Advanced; Two-mode cutting enables you to easily get what you want; Crop, watermark, subtitle, and add effects to the video at the same time, etc. Rotation: Rotate video clockwise or counter-clockwise; Flip video horizontal or vertical; Cut, crop, watermark, subtitle, and add effects to the video at the same time, etc. Splitter: Easily split video into numbers of smaller segments; Each segment can be limited by duration or size; More exactness and flexibility of manual splitting, etc.